Yes quite right @TrendFollower, it's a contrarian indicator, you do the opposite. Yes, @Caseynotes, 😀. This sounds cruel benefiting from the poor judgement of IG's clients! However if 80% of IG's clients are losing money it means around 20% of IG's clients will be making money. What I would like to know is of the 20% that are making money, are their profits greater than the losses of the 80% that are losing money on IG's platform? If IG could provide this information then it would really give a useful insight. Well @Caseynotes going against the large speculators is going with the other side (i.e. the Commercials) so really it depends on which you think is the smart money at a given point int he cycle. As the large specs are mostly trend followers, a contrarian seeks to go against them (with the Commercials) at key markets turns, which is what I have done, let's see if it turns out to be successful but as I am stop protected and in credit so I will be fine even if there is yet another Bull rally. Of course it differs if you are talking about intra-day moves vs whole month moves so maybe we will always be at odds and both comfortable with that. The only thing I note is that even in my day trading days I always wanted to be with the long term trend, actually it was this that got me into long term trading. As to what is driving the current market price action, be it a Bull death struggle or just a consolidation I neither know (not smart enough to call that) nor care so long as I successfully identify price action and get in on the move successfully and with low exposure, which I use technical analysis for, successfully in this case. However, I do not trust only to technical analysis but position it within a fundamentals assessment. I have read some smart people talking about Trump's actions as being more about an effort to curb China's tech boom as a direct challenge to the US on this rather than a re-balancing of actual trade. There are plenty of fundamentals factors out there over and above what is being played out in the media right now so I don't need to get hung up on Trump's every utterance. In terms of definition of Bull or Bear, I agree and disagree with your view. For a short term trader maybe you can go with your approach to it but for long term traders the long term assessment is vital to ensure you know whether you are trading with the trend or counter trend. Each bearish phase since the 80s has been a counter trend retrace of a long long Bull since Bretton Woods, although you could argue that the 2007 move was motive and a full reset was curtailed by the central bankers actions, which then fueled the current bull phase. If that is true then this bottom (2009) could mark the end of any reset crash or maybe it continues on to do what it might have done without central bank interference in 2009. So for me we are at the end of a very long cycle and the down turn will be shorter in duration but of a similar price quantum. Appreciate that you go with the flow, not issue for me, but again, I have not heard a credible case either based on Fundamentals nor technicals for why stocks are a buy right now. Dow remains in touch with the range bottom having slipped though yesterday so not a clear break. Interesting reading in this Reuters article that the Fed remains unconcerned with the daily 'noise' and still sees a strong economy so not needing direct intervention as yet though recognises the schedule of rate rises may need to change, having had 7 in the last 8 months. There is no real feel of panic and difficult to see any real reason for one, the market has adjusted after some big players were caught offside following the Feds latest rate rise so difficult to see continuing downside until there is new news. The Fed (and all big movers for that matter) are not glued to and ruled by the charts, technical analysis is only a tool that at any one time may or may not have an influence. There remains (as the Fed clearly thinks) the real possibility of a rally back up once the pain of the last rate hike has been digested. Correction to last post re; FOMC rate rises '7 in the last 8 meetings - not months'. All 4 looking very similar in set up and waiting for a sign as to direction for the day. 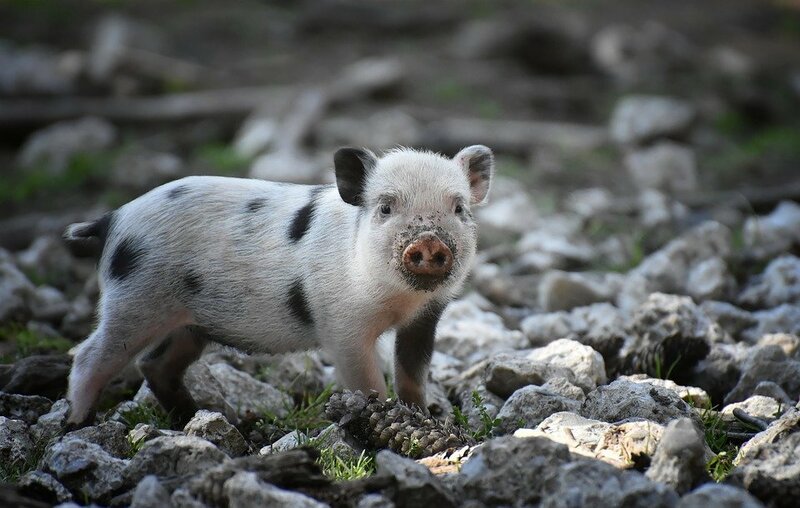 Overnight repeat of poor China manu prod figures looks to have caused an initial drop but Dow and Dax holding up on the European open and so now waiting for the London open. Dow poised on the old support level 23110 which failed to act as resistance during the holiday period rally. Dax and Ftse remain in step after the morning session which saw a strong 8 AM 1 hour push down which was immediately countered. Dax blocked from upward continuation by prior support turned resistance at 10559. Much will depend on the US open at 2:30 PM. 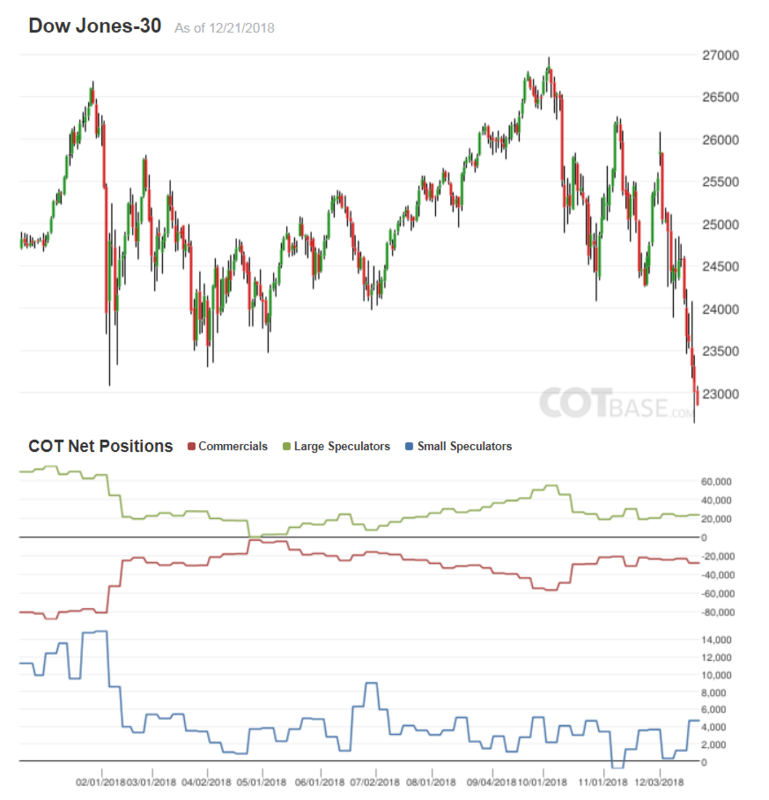 Review of the COT data of the Dow last updated 21/12/18 shows large speculators retaining net longs in similar respect to the COT chart of the 14/12/18 posted above in this thread. In the chart below comparing the Feb decline verses this recent decline it's interesting there was no real washout this time round and was much more controlled suggesting less panic and more a case of managing potential high risk over the holiday break. Next COT snapshot will be after close on Friday which is also a NFP day. The Apple news late yesterday (big drop in expected revenue due to China slowdown) causing a bit of a fire storm across the markets with usdjpy most affected seems to be contained within the indices now. 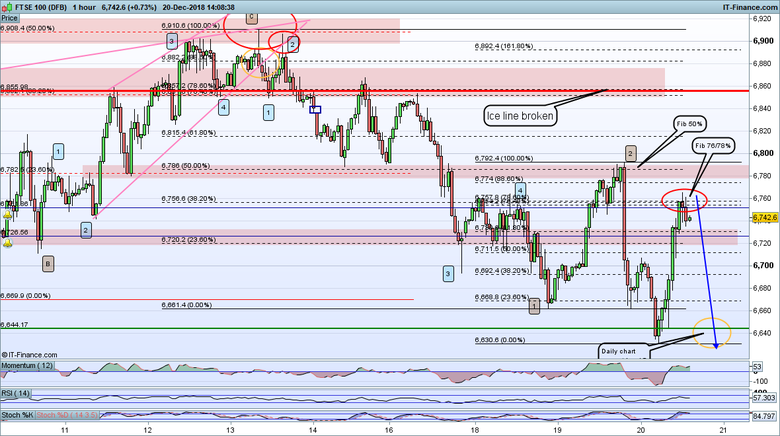 Clear short term targets for Dow, Dax and Ftse once the mornings direction is decided. ADP NFP today 1:15 pm may give a hint to tomorrow's NFP figure, also US manu PMI at 3:00 pm expected to be 57.7. On the daily chart the 'Trade of the Week' Dow short looks perfectly reasonable but that hourly chart looks very indecisive in comparison. TotW; Dow Short: Entry 22914. SL 23535. Was called mid day yesterday so the retest of resistance later in the day would have caused a bit of concern but Apple saved the day 😊. Price now back around the entry level at the mo but I would prefer to see the prior low at 22812 taken out first (yellow dash on 1 hour chart is a 4 hour chart support level so not shown on daily chart) . Big beat on the ADP US employment change. + 271k verses + 180k expected (previous 157k). Bodes well for tomorrows NFP which is also expected at around 180k (previous 155k). The major indices are playing out like I envisaged. It is nice to see the price action confirm my assumptions that are being tested as we speak. I would not want to go long any of the major indices right now and would certainly not want to go against the trend. It is not just a falling knife at the moment but a falling 🗡 dagger that could turn into falling ⚔️ swords for those who try and be contrarian with the wrong timing. Yes very much a data driven day today @TrendFollower. The ADP US jobs data came in really high but just after the US open the US manu PMI came in at a big miss 54.1 verse the 57.7 expected and though still a positive number the market didn't like it. The jobs data is a lagging indicator while the PMI is a leading indicator so the PMI miss took priority and the 3 pm bar gapped down on the news driven initially by the algos. Price seems to have stabilised since the initial reaction. Yes the market is not appreciative of the numbers released. It is also not showing any signs of sympathy even if the numbers are positive. The price action is telling us the story in front of our very eyes. The markets are discounted around six months into the future. So it is telling us the 'future of around in six months time'. Steady retrace after the slide down on poor US PMI figures yesterday looks to be on the back of gains on the Shanghai Composite which is up 1.7% after hitting a 4 year low. Will be looking for continuation to resistance as Dow looks to have recaptured 22812. Major indices are tricky to trade due to the price swings, whipsaws and volatility. It is why I favour a long term trend trade rather than short term on major indices but that's me. The volatility is brilliant for short term swing traders as there are plenty of swings they can capture. When it comes to the house market figures out today from Nationwide (showing the smallest house price increase in a looooong time) what are peoples expectations? Next year will start to fall...rapidly. With a ‘hard Brexit’ - leading to a plunging pound, sharp rise in inflation - creating a rise in unemployment and BoE interest rates. Each one is toxic for the UK housing market - combined its lethal! I think this will hurt, but I don't think it would prompt the 'next crash'. Those always come from something which no one has an eye on. Unlikely to be a repeat as it was previously. Will be interesting to keep an eye on the house price figures @cryptotrader, the govt has a long history of intervening anytime the boomers nest egg is threatened but by now most need help from the bank of mum and dad to even contemplate buying one. Something of a paradox. When you say 'next year' are you meaning 2019? Dax looking at the 10640 resistance level after the NFP beat. 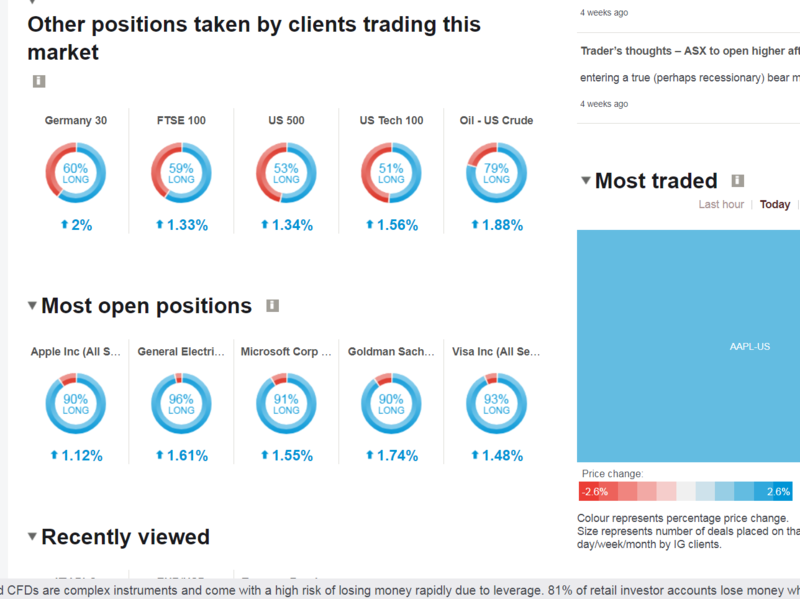 Was looking at client sentiment for Dow (56% long) and was surprised by the other indices as well as the 'most' open positions (see pic) the US large caps. ps; remember to be logged in for the expanded market data pages. pps; Dax now looking to 10712. Interesting position to start the week. Dow bulls will be looking to secure this resistance level to use as support. US non-manu PMI data (news) today at 3:00 pm, 59.6 expected, 60.7 previous. Dow still hanging onto the daily chart resistance level 23440 (orange) while Dax dropped down in the morning session to find support at 10702 (prior resistance daily - orange). Dax looking to continue upward to test 10895 having retested the daily resistance turned support level 10702 though overnight orders causing an initial push down on the European open. Dow looking to clear 23685. Interesting monthly ftse chart with price attempting to break back up above the monthly support level (turned resistance?). Securing 6839 looks to be important for both the bulls and bears. Worth taking a refresher look at the daily charts. Dax did progress as expected in yesterday's post as did Dow and both now approaching new resistance though Ftse looks untroubled and has pushed on ahead. Looking today for continuation upward if Dow can leap the blue resistance level 23881. Still no hard news out of the China-US trade talks but there must be something sometime and it will move the markets. nb; the COT report has been held up due to the US gov partial shutdown. 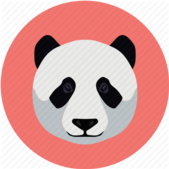 There is an unscheduled 3rd day of talks today between the US and China so one would assume either today or tomorrow at the latest there will be a statement released to the media. I assume you are inferring that positive news will move the market upwards? I have seen stranger things happen in the past where the markets move upwards in anticipation of the positive news and once it is released there is a sell off and major profit taking. I am not suggesting that will happen on this occasion but one must keep an open mind of the possibilities. Quite right @TrendFollower the market can turn any which way on new news but I also wouldn't assume good news either. The unknown is always 50/50 until it becomes a known so it's a case of preparing for either. Some would have us believe that markets are technically driven but that is not so. Fundamentals are the market drivers, technicals just describe how price moves in order to get there. That is why I always wait for direction to be evident and a most obvious target identified and only then look for an entry point. It's just not worth trying to second guess the market, you will constantly be getting trapped. I don't even try to catch turning points anymore but rather wait for the first pullback to fail to be a reversal and join the continuation of the new trend. Dow did attack the 23881 but failed this morning and PA somewhat aimless since ranging within the 4 hour support and resistance levels (green) while Dax has been gyrating around 10911. Ftse holding up well but not able to break away on it's own. 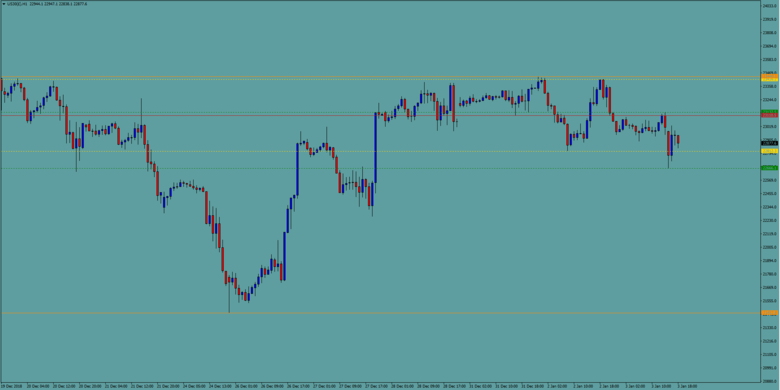 Will be looking to the afternoon session for another attempt at the resistance levels though traders may be waiting for the latest FOMC meeting minutes published today at 7 pm which could well provide a spur one way or the other.